If you wish to learn to Scuba dive, I can teach you. I have been teaching watersports since I was 16 years of age. I was a Kayak and Sailing instructor for over 10 years at local authority watersports centres and I have been qualified to teach SCUBA and snorkelling since 1994. I took up freediving a number of years ago and love that too. I enjoy recreational scuba and freediving in quarries or the sea and have been abroad many times on courses and on holidays. I continue my education finding experienced divers whenever I can, I became teacher qualified (PGCE) in 2001. My main motivation to teach is that I just enjoy being underwater, also I enjoy being with friends and like minded people. Our groups have no stress and we just enjoy what we do. I teach independently of schools as well as with them. I find I can offer the best flexible package for each persons need this way. 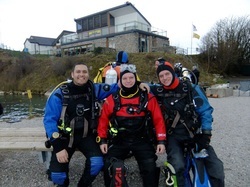 I teach the generic agency qualifications, I have taught for the BSAC, SSI and PADI. I have realised that the right instructor is more important than the right agency. I offer day trips if you want supervision or extra tuition, and I also offer training to cover specific needs, such as buoyancy, or new equipment such as DSMB or anything else you require, but the 'next course up' doesn't cover for you. With 20 years of experience I am sure I can help in some way, and if I feel I don't have the skill set for a very specific job, I will give you that honest advice, and offer my recomendations.